The Snow Performance Water-Methanol injection system is capable of running various concentrations of methanol, but choosing the right mix is vital to maximizing the performance and economy your kit offers. The Snow Performance Water-Methanol injection system is capable of running various concentrations of methanol, but choosing the right mix is vital to maximizing the performance and economy your kit offers. We will go through how the fluid interacts with your engine and combustion process and what the pros and cons of various fluid concentrations are. Since the cooling, energy and combustion characteristics of ethanol are so close to methanol, it can be used as a close second fluid. Although Isopropyl is an alcohol, it’s combustion characteristics are not suitable for use in this application. We will start with the effects of water-methanol in various mixtures in gasoline engines. One of the largest obstacles facing those looking to increase the horse power of their boosted or high compression engine is detonation or knock. To increase the power output of these applications, increased spark timing or boost must be utilized. If the resultant heat in the combustion chamber surpasses the detonation resistance of the fuel, the result can be engine damage. To reduce the chance of detonation higher octane fuels are used which have more detonation resistance, but the cost is prohibitive for many; this is where water-methanol injection can save the day. It gives big increases in resistance to detonation and uses a relatively cheap fluid only when needed. Water-methanol injection creates safe power and eliminates detonation by lowering intake charge temperatures and raising effective octane. Both water and methanol play an important role in achieving this result and the mixture of water to methanol can greatly affect the results of injection. Water and Methanol both have high latent heat of vaporization characteristics and will pull the heat out of the air which performs an inter-cooling effect. This inter-cooling effect leads to cooler intake charge temperatures and higher air density which is exactly what an engine needs to make power. Water-methanol injection also achieves power gains by raising effective octane and allowing timing to be advanced. Water does not technically have an octane rating because it will not burn, but water vapor in the combustion chamber will slow the flame down in the combustion chamber leading to an effective octane increase. Methanol is an alcohol with an extremely high octane rating that when mixed with the water adds significant control to the flame front in a cylinder once combustion happens. The control of the flame front equates to a more stable cylinder environment. By resisting detonation and producing a more controlled combustion event, water-methanol injection achieves its power gains at a fraction of the cost of race fuels. 50/50 water-methanol( Boost Juice® ) will beat 116 octane race gas. We can see that as the concentration of methanol goes up so does the effective octane and attainable power. However, this ratio of water to methanol and effective octane is not linear and will not increase performance to the same degree as the mixture moves past a 50% mix. There is only so much octane an engine can make use of and the performance increases begin to plateau once the mixture moves past this concentration. There is slightly more power to be found at increased levels of methanol but this carries increased risk and we have found it is generally not worth the results. There are two main reasons we do not recommend running significantly higher than a 50/50 water methanol mixture. Pure methanol has an extremely low flash point and burns invisibly making safety a major issue when used by anyone but professionals with proper equipment. Additionally, because methanol is a fuel, the more that is injected, the greater the resulting change will be on the vehicles air to fuel ratio. We have found that when running a 50/50 mixture, the air fuel ratio will stay within acceptable margins and will often return to pre-injection levels once the timing and boost pressure has been advanced to take advantage of the effective octane increase. This means water-methanol injection can be stacked on top of a tune and the engine will be able to run if the reservoir should run dry. When a greater concentration of methanol is used we have seen the air to fuel ratio change enough to need specific tuning to account for the difference, this leaves the vehicle with a water-methanol dependent tune and it will not run properly if injection is interrupted. For these reasons we have developed our Boost Juice® as the best balance between power and safety. The 50/50 mixture has enough water to be safe to use and enough methanol to put the effective octane way-up there. Boost Juice® is also “clean” and standardized so you know what methanol concentration you are getting. Next we will move on to diesel engines and the effects various mixtures have on performance and economy. To get an idea of how different fluid concentrations effect diesel engines let’s look at the ways water-methanol injection interacts with the combustion process in a diesel. Since a diesel is a heat engine (the heat of compression ignites the A/F mixture and there is much wasted heat as the result of combustion), water injection goes back to its inception. Rudolf Diesel was a student of thermodynamics and his first engine patent contained water injection to use this wasted heat to make steam in the power stroke for additional power. Methanol is a good adjunct fuel in a diesel to make even more power. The key point is that combustion temps. are decreased dramatically when water-methanol is manifold injected along with a large increase in power. The fact that methanol auto ignites after diesel and the fact that it increases ignition delay makes it a good, safe adjunct fuel in your diesel engine. It has a cetane rating of 4 which basically indicates that it slows auto-ignition. This means that peak cylinder pressures aren’t increased significantly and that power is increased after TDC during the power stroke where it can be done safely without undo strain on engine components. These effects of water-methanol injection combine to produce lower exhaust gas temperatures as well as safe power. Tap Water – great for warmer climates and for EGT reduction while towing. It has a higher propensity to quench combustion so not as good as a methanol mix in that you can’t inject as much by volume. Check your nozzle filters frequently as some tap water contains a lot of minerals – clean with CLR shower cleaner. The use of purified water means longer time periods between nozzle cleaning. You really can’t feel any power gain with water but will show about 20 hp on the dyno with a diesel pick-up. Winter Blend Windshield Washer Fluid (-20°f, blue) – This is the most common fluid used with diesel applications. It is easily available at Walmart (less than $2 gal) and auto parts stores. In California and some southern states, you may have to get it over the internet. Best balance of EGT control, power (50hp), and cost. 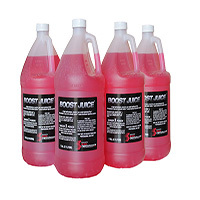 50/50% Methanol- Water (Boost Juice®) – more power (75hp) than windshield washer fluid and great EGT control.